Second Try for Astros Ring Giveaway by Grizzlies? For the fourth time this decade, the World Series has come through Fresno. With the Astros winning its first baseball title in franchise history, the Fresno Grizzlies can make the claim of its fourth world championship by virtue of its affiliation with a championship club. No other Triple A team has claimed that distinction since the Columbus (Ohio) Clippers, affiliated with the New York Yankees through its World Series run of 1996 and 1998-2000. And, let’s not forget that the Fresno Grizzlies won its own Triple A national title in 2015. How will the Grizzlies mark the occasion? If past history with the Giants provides any clue, expect to see a tour of the World Series trophy come through Chukchansi Park. And now the Grizzlies can finally give away that 2017 replica ring they they had hoped to distribute three years ago. Sellout crowds have followed Grizzlies championship ring promotions during the San Francisco Giants era. Some fans would wait in line for hours just to collect the ring, and then go home. Some have kept them on a shelf. Others wound up on eBay. It’s a huge promotion for the Grizzlies. Which explains why this would not be the first time the Grizzlies have attempted to honor the 2017 Astros title. 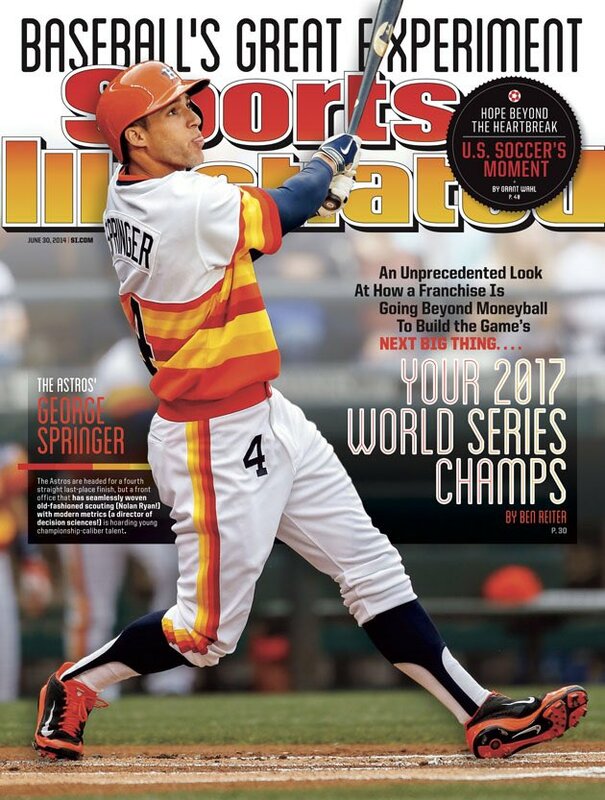 It dates back to a 2014 Sports Illustrated cover story, predicting the Astros would be champions three years down the road. The story highlighted the way the team drafted players and felt they were on the verge of something special. The Astros qualified for the playoffs the following season as a Wild Card. In the spring of 2015, the Grizzlies commenced its affiliation with Houston after serving as the Triple A home for the San Francisco Giants for 18 years. Hoping to capitalize on the article and drum up support for the new partnership, the Grizzlies announced a “Back to the Future” promotion (the movie celebrated its own 30th anniversary in 2015). At a news conference, the film’s iconic DeLorean was on display; mock ups of special “Back to the Future” uniforms and a large cover of the Sports Illustrated issue served as backdrops. The team also announced it would give away 2017 World Series replica rings to fans in anticipation of the championship to come. 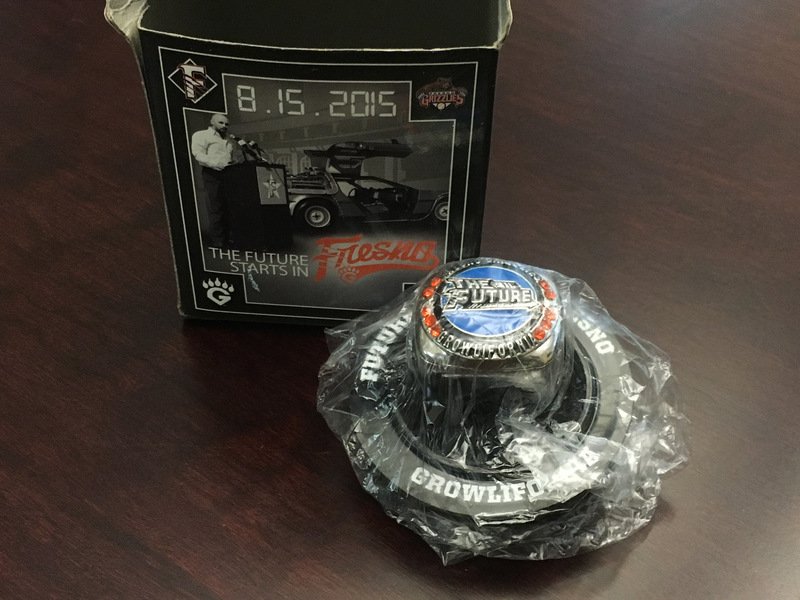 The 2015 Grizzlies ring giveaway that was supposed be for the 2017 Astros World Series victory. The proposed promotion received nationwide attention. Unfortunately, the Astros front office put a kibosh on the operation. Didn’t want to jinx something down the road, the word went. So, the Grizzlies handed out a generic ring instead. The Grizzlies always took pride in supplying the Giants with World Series talent, incorporating the slogan “17 of 25” to denote the number of championship Giants players who had worn the Grizzlies uniform. On this year’s Astros squad, eight members spent time with the 2017 Fresno nine. They include superstar shortstop Carlos Correa; outfielder Derek Fisher, who scored the game-winning run in Game 5; reserve catcher Juan Centeno; and pitchers Joe Musgrove, Charlie Morton, Lance McCullers Jr., Collin McHugh and Will Harris. Other Astros who played for Fresno previously include third baseman Alex Bregman, first baseman Yuli Gurriel, and pitcher Brad Peacock. Dodgers pitcher Josh Fields played for the Grizzlies in 2015-16. While the Astros-Grizzlies pairing has been fruitful, it may come to an end after the 2018 season. Blame the complicated merry-go-round that defines Major League-Minor League relations. A Player Development Contract is the document that binds two clubs – with a term of two or four years. Contracts are renewable after even-year seasons. The Grizzlies agreement with Houston expires after 2018 and early speculation is that it won’t be renewed. That’s because the Astros are likely to pick a partner closer to home, namely, the Round Rock (Texas) Express, only 165 miles away. It doesn’t hurt that the family that owns part of Round Rock is intrinsically tied with the Houston club. That would be the Ryan family, which includes Hall of Fame pitcher Nolan and his son Reid, president of the Astros. Nolan serves as a special advisor to the big league club. So, the business connection makes sense. And, Round Rock is just a three hour drive away, which makes it easy to call up a player on a whim. Round Rock is currently affiliated with the Texas Rangers. But, the Rangers are expected to hook up with the San Antonio franchise starting with the 2019 season. San Antonio will be a new entrant into the Pacific Coast League, a result of the scheduled relocation of the Colorado Springs franchise. The Ryans have been involved with Houston since 2013. So, why has it taken so long to connect with Round Rock? It’s because Texas and Round Rock signed a four-year extension in 2012 to cover the 2015-18 seasons. The CEO and partial owner at the time with the Rangers? Nolan Ryan. Less than a year later, he left Texas under awkward circumstances. Thus, 2019 is the first opportunity for the two Ryan-family affiliated teams to connect. That leaves Milwaukee, the current parent club of Colorado Springs, as the odd team out. And, the speculation continues that they will pair with the Grizzlies. Are the Brewers anywhere close to a World Series? Maybe not. But Baseball America ranked their minor league system 8th overall last year (Houston rated 3rd). One other Triple A team that is guaranteed to need a new affiliation for 2019 is the Las Vegas 51s. Their parent club, the New York Mets, purchased the Triple A Syracuse Chiefs. That affiliation will begin in 2019. Syracuse’s current parent club, Washington, will also be displaced.